Sometimes the total size of all scanned files and folders on a disk still don’t make for the entire used space on that disk. This happens because there may be some restricted folders, which DaisyDisk couldn’t scan with default permissions, or which are even entirely unreachable. DaisyDisk detects the remainder of space and displays a special item hidden space of the corresponding size. purgeable space (covered in a separate article) — mostly local snapshots of Time Machine, and also swap files, sleep images and other temporary system files. other volumes (covered in a separate article) — sub-volumes within the same physical disk that share its pool of free space (a new feature of APFS). This item may include some invisible system volumes and the volumes you created yourself. System stuff, like Spotlight index, document versions, etc. 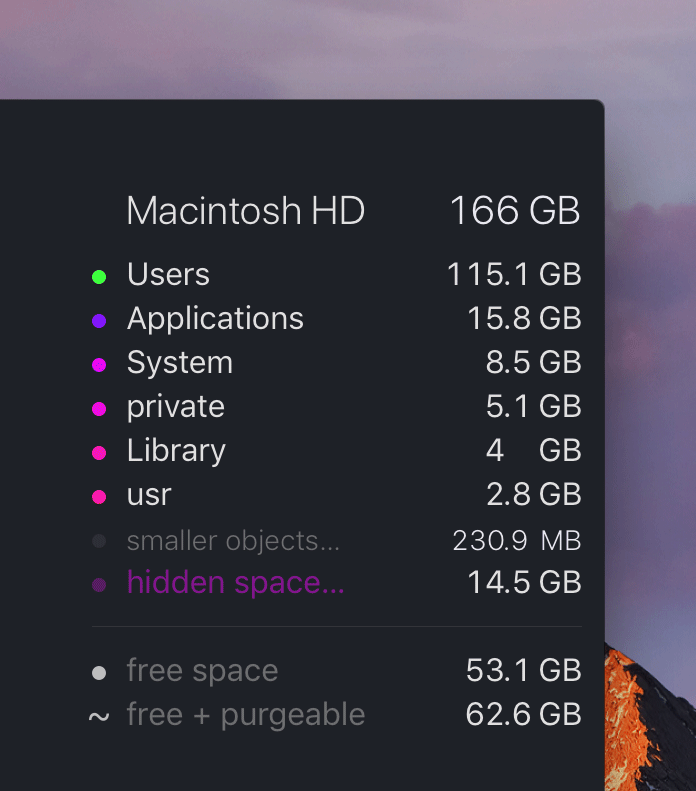 macOS Mojave or later: You may see a lot of hidden space if you deny DaisyDisk access to your Calendar, Photos, Contacts and other privacy-sensitive folders. The system shows you the corresponding dialogs and remembers your choices the first time you scan your disk. 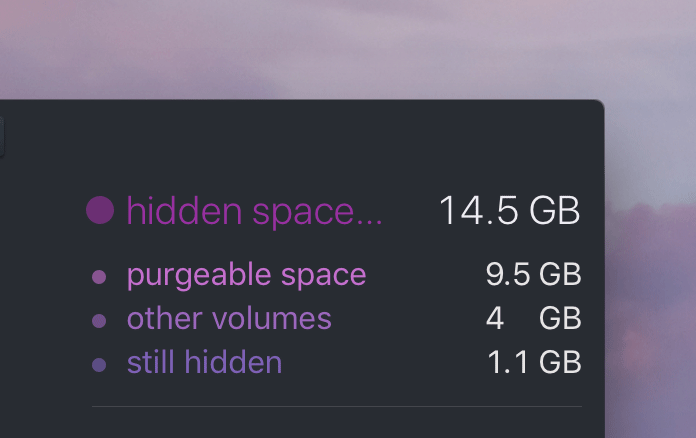 In case if you deny the access, the size of hidden space will grow by the corresponding amount, while some folders on the map will appear empty. To override your previous choices, you can open System Preferences > Security & Privacy, go to the Privacy tab and add DaisyDisk to the “Full Disk Access” list. Then rescan your disk. DaisyDisk will not read the actual content of your private data, only the metadata (such as name and size). This approach is recommended in Apple's official WWDC 2018 video which mentions DaisyDisk as an example (begin at 9:22). Use the scan as administrator command. The hidden space should disappear, or become significantly smaller by size. And in reverse, some other folders will grow in size correspondingly, and restricted files and folders will become visible here and there on your disk. Note that some small amount of hidden space (a few GB) may still remain even after scanning as administrator. This is normal. Usually this space is used by the file system itself. When you delete a file or folder and Time Machine is turned on, the system may not delete the files entirely, but move them to the purgeable space, causing it to grow by the corresponding amount. However, the system often delays updating the size of the purgeable space by few minutes. During this delay, you may temporarily see the hidden space being “borrowed” by the equal amount. DaisyDisk will automatically refresh (without rescanning) the numbers or hidden and purgeable space after the system updates them globally. Also, just after you delete the purgeable space, you may temporarily see the hidden space being “borrowed” by the corresponding amount. Please allow some time (from few seconds to few minutes) before the system completes reclaiming the purgeable space in the background. The purging may be additionally delayed if the Time Machine is in process of backing up. If you are using third-party backup tools such as Carbon Copy Cloner (CCC), they can create their own file system snapshots. Unlike the Time Machine snapshots, the third-party snapshots are not counted toward the purgeable space, but toward the still hidden space. You can check for presence of any third-party snapshots using tmutil listlocalsnapshots / command in Terminal. In order to reveal and delete such snapshots, please use the corresponding third-party apps. For example, here’s how you delete a snapshot created by CCC. Large amounts of hidden disk space may also indicate errors in the file system. You can use the Disk Utility to verify and repair your disk’s integrity. In some cases, you may need to boot your Mac in Recovery mode and run the Disk Utility from there. In the most obstinate cases with APFS disks, you may need to use the lower-level fsck_apfs command-line utility to verify and repair the APFS volume from the Recovery mode. Similarly, for HFS+ disks, you may need to use fsck_hfs. Beside verifying, you can use it to repair the HFS+ catalog file. WARNING: this operation may not be safe for your data! You should make a full backup of your disk before trying. Please seek professional help on the matter. Some backup tools are known to leave garbage in /Volumes folder. Check it out with the Terminal app. If nothing of the above helps, please contact our support.